Episode 85 - Since the North American leg of the RED Tour is over, your Taylor Talk hosts can now discuss it! Join Adam, Diane, and Steve for this extra-long episode of Taylor Talk: The Taylor Swift Podcast for Part One of our RED Tour review. We cover the first half of the RED show and we'll discuss the final half of the show next Monday. Don't worry though, if you're still waiting to see the RED show and don't want to be spoiled, you can still listen to the beginning of the show for Taylor news and mini-segments. Enjoy the episode! - Trivia: How many tickets were sold for the North American leg of the RED Tour? - Haters gonna hate, but Taylor's gonna keep doing her thang. - Taylor is bringing the RED Tour to LONDON in February! - You know you're a Swifty when you obsess over Taylor's toenails... don't ask. - Adam predicted the show opener, although he doesn't remember it all. - We love hairflip photo/hedgehog Taylor Swift so much that we used it for this episode's feature image. - Steve doesn't understand one of Taylor's costume choices. Pst. Men. - Note: I (Diane) corrected Adam about Jessica Rabbit post-recording... she was in Who Framed Roger Rabbit, not Looney Toons. - What is the difference between a carousel and a merry go round anyway? - Taylor snuck in a reference to a song she wrote before she was famous, "Lucky You," in a RED performance. - Diane & Steve love it when you send in Adam is So Vain submissions. Episode 84 - Two Taylor Talk episodes again this week? YES! In Episode 84 of Taylor Talk: The Taylor Swift Podcast, Adam, Maya, Diane, and Steve answer more of your ask.fm questions. We talk about our own personal hairbrush songs, how many amazing listeners we have in Alaska, and being fans of Taylor Swift, among other cool listener submitted questions. This is another one of our unedited episodes, so we hope you enjoy it! Happy listening and be sure to tune in for another new episode of Taylor Talk next Monday. - Adam likes listening to the tall, dark, and handsome Luke Bryan. - Steve talks about how he became a Swifty. - We theorize about why the RED tour was so much shorter than Speak Now and Fearless. - Alaskan listeners, we love you! All 700+ of you! - We encourage the secret Swifties not to be ashamed of their love for Taylor. - Taylor Swift likes her exes so much she buys tank tops with their names on it. - Leave us a question on our ask.fm/taylortalk13 for next week! Episode 83 - Adam, Diane, and Steve cover the Nashville shows, the last three shows of the North American leg of the RED Tour. We discuss special guests, Taylor being a trooper, and Ed Sheeran's silliness on stage. We also announce our upcoming four-part series where we'll discuss set design, costumes, and our opinions on the overall performance of each of the songs on the RED Tour! Stay tuned for that, but for now, enjoy episode 83. Happy listening! - Prepare for detailed RED Tour discussions in the upcoming weeks! - The RED Tour is going international next! - Sami gives us the last weekly RED Tour Wrap-Up for the North American leg of the tour from @TSwiftonTour. - "Sorry guys I have to go blow my nose. Can you guys scream so it's not awkward?" Taylor Swift, ladies and gentlemen. - Fun Fact: Hunter Hayes made Adam lose his voice. - Ed Sheeran surprised the fans (and Taylor) with some creative outfits: grumpy cat, cowboy hat, and clown impostor for WANEGBT. - You know you're a Taylor Talk Swiftie when whenever someone says a bad joke, you say, "That's an Adam joke." - Swifties are listening to "Can We Dance" by The Vamps, who happen to be Swifties too! - That awkward moment when Adam says the episode will be brief and it ends up being almost 40 minutes long. Episode 82 - Join Adam and Steve for another unedited, uncut edition of Taylor Talk! The boys have a last minute Nashville discussion before the tour wraps up. They theorize on who Taylor's special guests could be as well as some fun interesting things to do in the city of Nashville. Enjoy the show! - "Carly Simon did the Taylor Swift thing before Taylor Swift was born." - Sweet potato pancakes at Pancake Pantry is a MUST! - Could a Taylor documentary be in the works? Episode 81 - An EXCLUSIVE interview with 50% of Liv Spencer, Jen Knoch. Jen and her friend, Crissy Calhoun, are the dynamic writing duo behind the Taylor Swift biography, Taylor Swift: The Platinum Edition. Jen tells us why she decided to write a biography about Taylor Swift and how this biography offers insight other Taylor Swift biographies lack. We also put Jen to the test in a round of Taylor Swift trivia with facts taken from her own book! We hope you enjoy listening to the interview as much as we enjoyed recording it. Happy listening! - Scott Borchetta gives Swifties an update on when we can expect Taylor's "Sweeter Than Fiction" to be released. - Sami gives us the weekly RED Tour Wrap-Up from @TSwiftonTour. - We interview one of the authors, Jen Knoch, of Taylor Swift: The Platinum Edition, who happens to be a huge Swifty! - She also writes Taylor Swift fanfiction on wattpad.com/livspencer about the stories behind each track on RED! - The most interesting thing Jen learned about Taylor in the research process? How incredibly determined she's been since the tender age of 13. - Be sure to pick up Taylor Swift: The Platinum Edition!. Check it out on Amazon.com or from Barnes & Noble. - You know you're a Swifty when you make Diane explain what a simile and a metaphor is using the song "Red." - You know how Taylor Swift is feeling 22? Well, Emily's Army is feeling "Lost at 17." Because one Taylor Talk episode a week isn't enough... we've recorded a special mid-week episode just for you! In this unplanned, unedited version of Taylor Talk: The Taylor Swift Podcast, we answer some listener ask.fm questions as well as cover Taylor's CMA nominations. And since Adam doesn't tend to pay attention to what his co-hosts are saying, we hope you will. Happy listening! - Never done before - We just hit the "record" button and let it go! No editing, no script, but all the fun! - What Taylor song is the most relatable in our lives right now? - FYI: Diane is not related to JLo. - What are our least favorite Taylor Songs? - Adam is never in the mood for slow songs. Like ever. - The pessimists on the show don't think Taylor will win that many CMA awards. Unfortunately. - We rehash the time old question: is Taylor still country? This week in Taylor Talk: The Taylor Swift Podcast, we speculate on potential new Taylor Swift content for the fall. In the past, Taylor has released new albums in even years (ex. 2010, 2012) and gone on tour in odd years (ex. 2011, 2013). However, even in the odd years, she releases new content such as "Journey to Fearless," the Fearless Platinum Edition CD, and the Speak Now World Tour CD + DVD. In this episode, we theorize what Taylor could release this year... perhaps she'll even take the RED Tour to the big screen? Listen up to find out our thoughts and be sure to leave us some of your own in the comments below! - Make sure you check out the video of Taylor's week at the Staples Center that includes interviews and performances from Cher Lloyd, Sara Bareilles, Tegan & Sara, Ellie Goulding, and Jennifer Lopez. - Taylor Swift tours in odd years, but she also typically releases new content. Can we expect some more RED content? 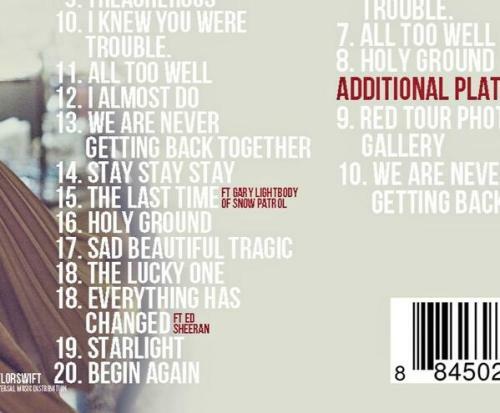 - We discuss the alleged RED Platinum Edition pictures that are floating around tumblr (including the image with two #18 track listings). - Rumor: a Platinum edition of RED could include the 10 minute version of "All Too Well," but it might just sound like a diary entry. - Could Taylor take RED to the big screen? Steve wants to dress up for the midnight premiere. - Note: this entire conversation is educated speculation. We aren't privy to any "inside information," unfortunately. - You know you're a Swifty when you not only have Taylor related dreams, but you have Taylor related nightmares too. Especially if your name is Adam. - What are Swifties listening to? Delta Goodrem, a singer/songwriter from Australia. - We give a special shout-out to Australian Swifties for being awesome! This week in Taylor Talk: The Taylor Swift Podcast, Adam, Maya, Diane, and Steve discuss one of Taylor's earlier songs: "Tied Together With A Smile." Taylor wrote this song when she was in high school for a friend who had an eating disorder. She paired a soothing melody with beautiful lyrics to create an incredibly uplifting song, even though the subject matter is a downer. Despite the heavy song topic, your hosts never fail to provide you with laughs and lively discussions about Taylor's f-bomb at the VMAs, Harry Styles, and future Taylor & Ed Sheeran collaborations. Enjoy the show! - Coming Soon: a new Taylor Swift song! Stay tuned for more details. - Ed Sheeran clears up why Taylor dropped the f-bomb in a conversation with Selena Gomez at the VMAs. - Even though Taylor Swift and Harry Styles are never ever getting back together, are they cordial? - Tied Together with a Smile. Proof Taylor Swift doesn't just write about romantic relationships. - Adam encourages Steve to write a song about Taylor Swift. - You know you're a Swifty when you want to trade in the penny for a thirteen dollar bill. - Adam and Maya launch into an impromptu debate: will Taylor and Ed Sheeran do another collaboration?